US pop star Michael Jackson has postponed an appearance at a Christmas party in Japan, where tickets cost up to 400,000 yen (£1,787). Jackson was due to attend the party in Tokyo on Tuesday, although he was not planning to perform. The event has been put back to 8 March, with a fan appreciation event being held the following day. 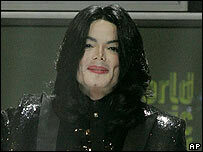 Last month Jackson carried out his first public engagement in London since being cleared of child molestation. The event was marred by disappointment when Jackson sang just a few lines, when the audience had been led to believe he would perform a medley of his songs. Organisers of the Tokyo event said Jackson wanted to postpone his appearance to add an extra date to his schedule. Jackson's role at the party is to simply sit down to dinner with guests while listening to his recorded music. Gospel singers and dancers are expected to perform. For those buying the top-priced tickets there is the chance to meet Jackson and have a photograph taken with him. Those paying 200,000 yen (£895) will get a signed portrait of the star. Tickets for the fan appreciation day will cost 15,000 yen (£65), which allows people to watch dancers perform to Jackson songs, while the singer himself watches from a separate area.